Getting a picture taken with Santa Claus at the mall is a beloved holiday tradition. Waiting in long lines with squirmy youngsters to see Santa is not. This year the Kitsap Mall Santa is giving parents an early Christmas present in the form of an online reservation system. 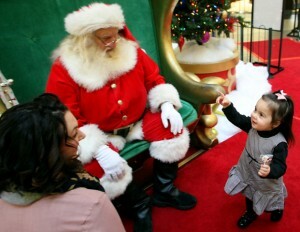 Shoppers can register in advance for time slots with Santa by logging onto mysantaexperience.com, according to a news release. Reservations require the purchase of a photo package, which start at about $35. Santa arrives at the mall Nov. 14, and will stick around through Christmas Eve. A special “Paws with Claus” night is scheduled for 6-8 p.m. Nov. 19, so “well-mannered” pets can have their picture taken with the jolly elf. WorldWide Photography will have a regular family portrait area set up adjacent to Santa’s court. 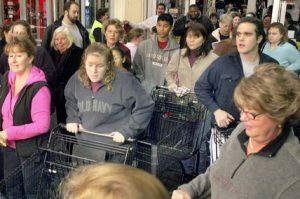 In other mall news, the Silverdale shopping center will be open from 6 p.m. to midnight on Thanksgiving day, and 6 a.m. to 10 p.m. on Black Friday. The opening of H&M, initially slated for November, has been pushed to Dec. 17. You can find more holiday event information on Kitsap Mall’s Facebook page. The 2013 holiday season was kind to Kitsap retailers, according to number released Tuesday by the state Department of Revenue. Retail trade, which includes traditional stores, dealerships and online sellers, generated $487,117,141 in taxable sales in October, November and December. That was a 5 percent improvement over the fourth quarter of 2012. Car dealers, furniture stores, sporting goods suppliers and e-commerce, did especially well. Sales for all industries were up 6.4 percent from 2012, totaling $895,050,130. Industries showing healthy growth included manufacturing, construction, information (software, telecom, print and other media) and restaurants. 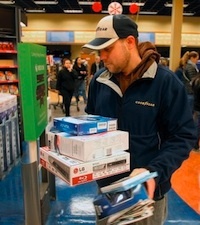 Kitsap sales were in step with the rest of Washington, which saw a 5.8 percent rise in overall sales in the fourth quarter. The long-term trend is positive for our county. Fourth quarter retail trade sales have climbed steadily since 2008 and are close to matching the pre-recession high of $493,353,867 recorded in 2006. Fourth quarter sales in all industries have been on the rise since 2009 and are also closing in on a 2007 high of $925,280713. Kitsap also enjoyed a 6 percent rise in third quarter sales last year.